Instagram is adding more controls for its users to stop bullying and hate speech. Instagram CEO announced on their blog that the new tools allow users to completely turn off comments or like the comments to encourage community. It also added privacy controls for private account holders of Instagram. The new tools and changes will make Instagram users safe and will encourage sharing of photos with out harassment or online bullying. The commenting system got the major changes, in the next few weeks everyone will get the feature added that allows users to completely turn off comments while adding a post itself. This feature is indeed good for many users who wants to share some pictures which might invite hate speech or bullying. However users can enable the comments on those posts later if they wish so. 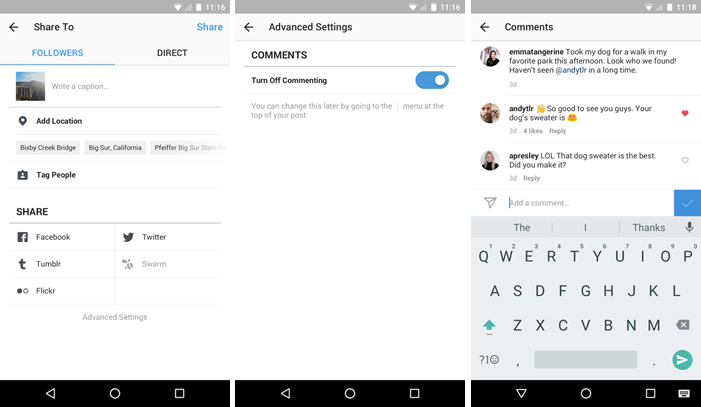 Another feature allows users to like comments on any post, this will encourage more comments from users and for a healthy discussion. Comment filtering using keywords is already available and with the new tools users will get more control of the commenting feature. Private account holders always have the ability to accept followers at their will, but once they have accepted a follower there is no way they can remove those users from their follower list. A new feature is being added that will allow users to delete their followers with out notifying them. There is another interesting feature that allows users to report anonymously about some other users if they are risking their lives or if you think they might self-injure themselves, the blog post says Instagram will connect these users to some organizations which will help them to avoid risks.